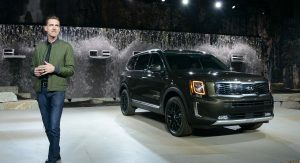 The 2020 Kia Telluride has just been unveiled in production guise at the Detroit Auto Show 2019. 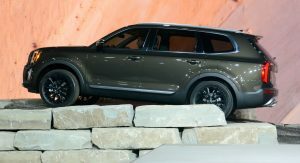 Kia’s Telluride is the brother to the Hyundai Palisade and is the largest vehicle to ever wear the Kia badge, providing seating for up to eight people in comfort. 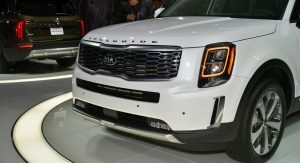 The South Korean automaker previewed the Telluride on a number of occasions last year with tricked-out concepts adorned with unique exterior components. 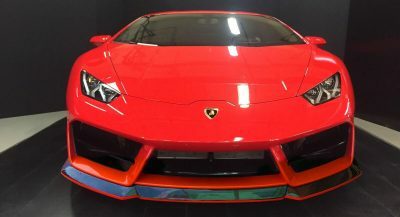 Consequently, the design of the production model is no surprise. 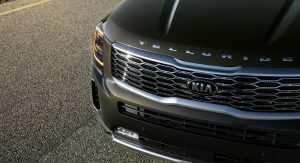 Up front, the Telluride gets squared headlights, a large grille with chrome accents, and an impressively imposing hood. 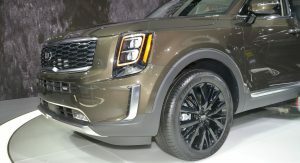 The sides incorporate bulging arches and on the vehicle pictured, gloss black wheels which give the SUV an appealing personality. 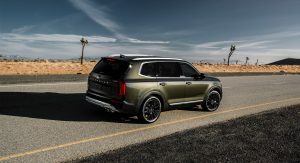 Under the skin, the 2020 Kia Telluride is powered buy a large 3.8-liter V6 engine delivering 291 hp at 6000 rpm and 262 lb-ft (355 Nm) of torque from 5200 rpm. 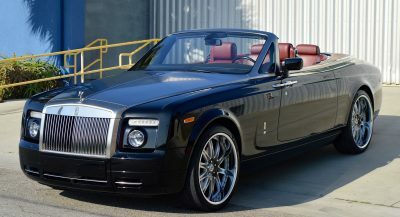 Coupled to this engine is an eight-speed automatic transmission that sends drive through the front axle as standard or through an optional all-wheel drive setup. 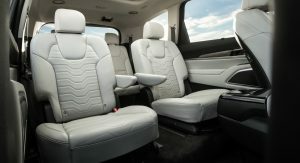 A number of optional extras are available for the Telluride. 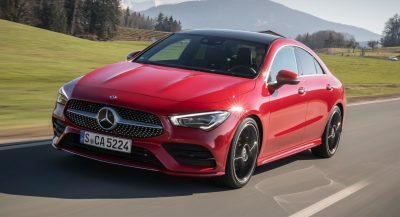 These include Blind Spot Collision-Avoidance Assist Rear, Rear Cross-Traffic Collision Avoidance Assist, Lane Following Assist, Safe Exist Assist, Highway Driving Assist, Head-Up Display, Driver Talk, Quiet Mode, and a Rear Occupant Alert. 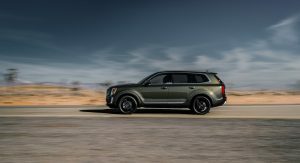 The cabin of the Kia Telluride includes a 10.25-inch touchscreen with Apple CarPlay and Android Auto. Also found within is a 10-speaker, 630-watt audio system from Harman Kardon, wireless charging, and six USB charging ports. 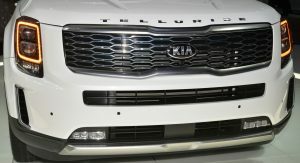 The Telluride will be built at Kia’s manufacturing facility in West Point, Georgia and sales will commence later this year. Prices have yet to be announced. 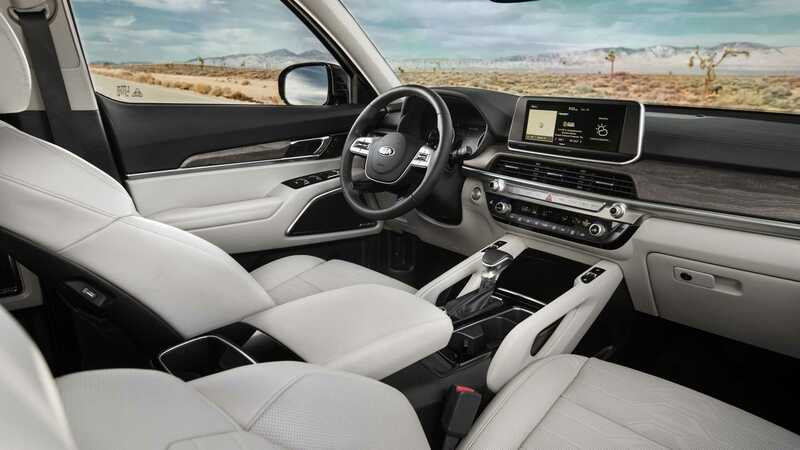 @salamoon:disqus Agreed.At least Kia’s interiors change significantly every 3-5 years. What was wrong with the Borrego? As case of incredibly bad timing. Which may happen to this one as well. The Borrego is still around (Mohave) in other markets. 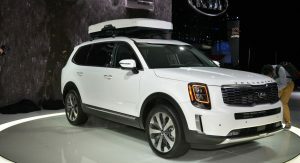 Kia will most likely slap a Mohave badge on this and sell it as the redesigned version. 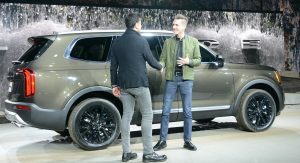 Oh, I am so sick of CUV/SUV intros. I’ve hit overload and can’t stand it anymore. I can’t be the only one. 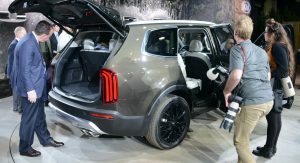 Stop clicking on and commenting on the CUV/SUV articles , 1st step to recovery. Hard not to when that’s basically all there is. Pathetic. I like it more than the new Explorer. Definitely more than the Caddy! The Taillights looks like an inverted Hyundai Palisade, both of them have vertical tail lights. It reminds me a little bit of GMC SUVs. Anyway I would still pick K900 from new KIA’s products. Honestly, if you need that much space, you’re better off with a Sprinter. Practically and stylistically. i guess you would offer a Sprinter also to every customer who would like to buy a GLS, Q7, RR or other bigger SUV…. Sprinter drives/rides more like the commercial van that it is. AT FIRST GLANCE I THOUGHT THIS WAS THE NEW CADILLAC XT-WHATEVER. It’s better than the Cadillac XT6. That’s for sure. The shape of the taillights is sort of similar, but on the Kia they’re actually, you know, interesting. You gotta be kidding! This this is as ugly as sin! Plus comes with crappy Kia quality. The only crappy thing here is the badge it self, Kia quality in very good now. Not like last decade, you need to update your info. I own a 2016 Optima, guarantee the quality is better than any GM product south of $70k. Agreed, I rented a sorento a while ago for few days, and was impressed with the quality and features. Yes. Not especially impressive itself, but still better than the XT6. Sort of sad. Anything is better than the XT6. 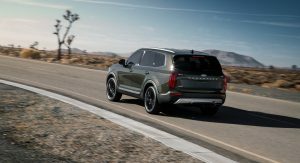 One minor detail: The Kia Telluride will be available for retail sale in the next few months, not next year. They should start show up in the local Kia dealership’s showroom in February 2019. That is correct, it will be sold from this year. We’ve amended the story. Thanks! But they probably sell it as a 2020. I don’t get the 3 row SUV trend. Its not like the average family size is growing. Why do people think they need this? Agreed. Just give me the extra cargo space. Make the seat an option. There is six in my family so I need that extra row.. that’s why.. Families of 6+ or smaller families w/ big teenagers and a dog or 2. For many, even something like this isn’t big enough which is why they get a Suburban or a Yukon XL. It’s also because, aside from generally poor parenting, Gen X parents don’t care one bit about money, spend it like crazy (even if its borrowed) and LOVE to play the “Keeping Ahead of the Joneses” game. That’s also why. 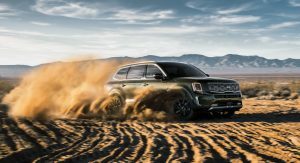 Kia builds a better Atlas. 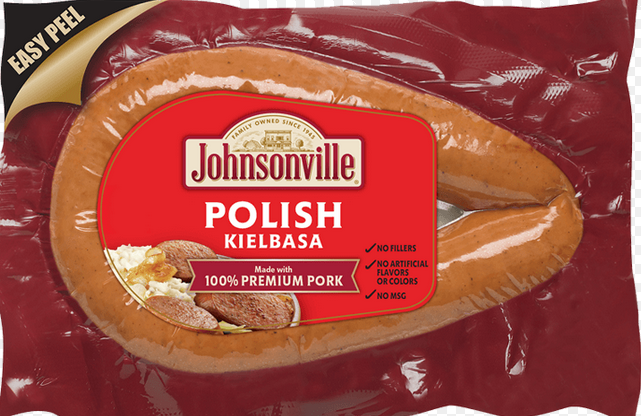 This makes my wiener hard. Ball Park or Oscar Mayer? 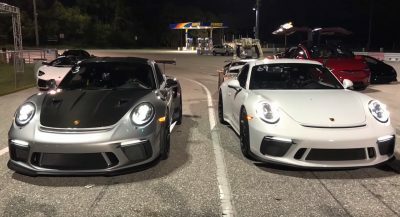 This pissed all over the GR (Good Riddance) Supra and the Cadillac XTra bad-6. this SUV is much more exciting! Have they stolen Range Rovers grille? I like it! 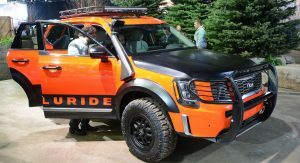 It looks more masculine than the Ford Explorer and it has more road presence than the new Cadillac XT6. Kia is going to print money with this. Please tell the Press that. They’re predicting a dud. The live video helped sell it to me. Looks pretty decent and way better than the Hyundai counterpart. Side angle and rear are gorgeous! 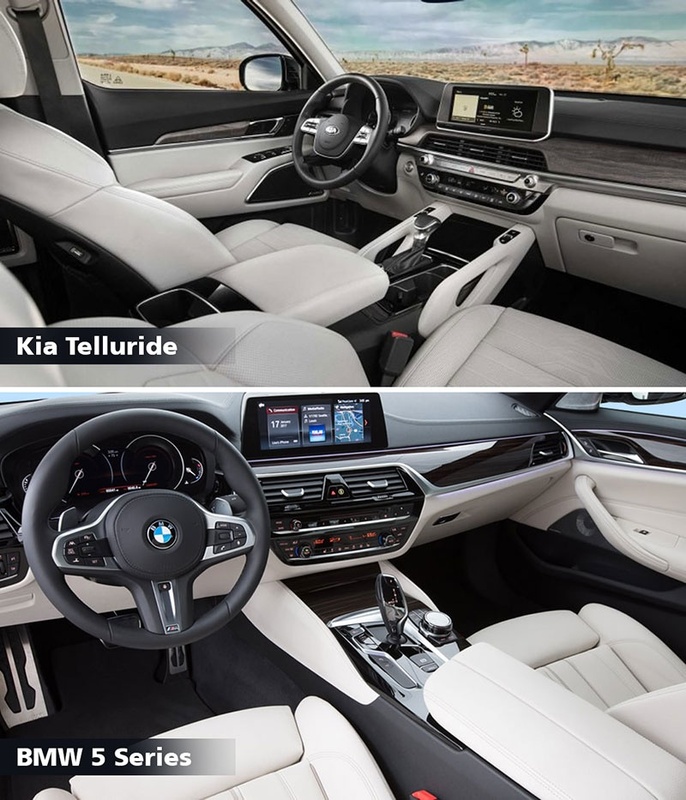 Interior and front end: meh – don’t love it but don’t hate it. Ahh, so the clutches in the RDM send 20 percent of torque to the rear wheels…. used to be only 10 percent as the default. Still prefer the new Ford Explorer (drivetrain wise). Now it has a transfer case, which is far better than any RDM setup. UGLY! A face only a mother can love. Not nearly as ugly as the Palisade. Seems odd that those LED DRLs appear to be orange. It looks good. the only thing other than the stand up infotainment screen that I dont’ particularly care for are the headlights. Korean >>>> American! 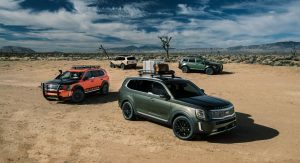 Kia’s gonna kill it with Telluride! Somebody please tell GMC, Ford and Chevy how to design cars! The tried the big SUV thing right before the last recession too. Ironic. 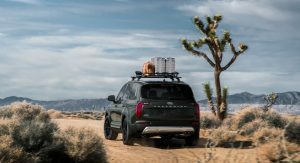 Disappointing towing capacity, was hoping it would be closer to an expedition and not have the same towing capacity as their current SUV. After all they also have 3 rows of seats now and probably cost less. 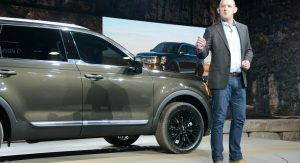 The fake vents by the front wheels are disgusting, other than that a really cool looking SUV. And how can you confirm they are fake? 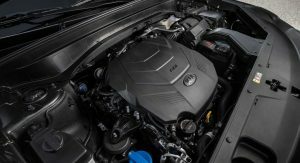 The only real vents on most Hyundai and Kia products are in fact those in the front as an air duct for cooling the brakes and dissipating air resistance. I should know, my Optima has functional front vents. What are you talking about, that car is driven by a twin turbo V6 already.. so exactly is clueless? Are you sure @nkululekoduma:disqus ? In the article it says it’s a 3.8L V6, not a TT v6. That would be you. 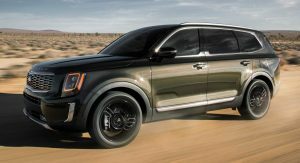 In the North American market ( which is the only one that matters ) the Kia Telluride is only available with a 3.8 liter naturally aspirated V6. The Press is already predicting that hardly anyone will notice this in the marketplace. Normally, I’d say to expect huge discounts, but this is Kia. Its dealers don’t care if they don’t sell a car in a month and hold the line on overpricing vehicles on the lot. Around here, they want $19K for a base Optima, while Hyundai dealers will take $16.5 for a base Sonata. Maybe it’s the much uglier Palisade that’ll have the huge discounts. 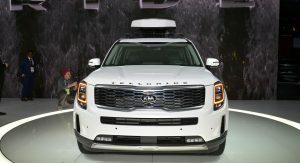 This thing is going to sell like crazy for Kia, just like the Sorento is. 5,000+ sales in the first month, and my local dealerships sold out within 4 hours, for an anecdotal bit of evidence. They had 10 on the lot and let no one test drive them because they all were sold. 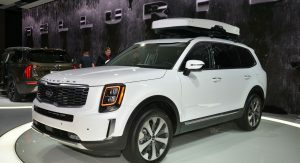 And the Cadillac XT6 became an afterthought. A mix between Volvo and Cadillac, not bad in the end. I think it looks good, especially when compared to the competition. If it’s priced right, it will sell. I see the Pilot as the primary target here. It’s quite handsome and should sell like hotcakes for them. Right, at least it will sell better than the old Mohave. The concept was fantastic, this isn’t. WHY on earth those orange LEDs ???? ?